Have you every driven past a car that looked like its own billboard? Have you ever heard of people saying that they make their car payments by putting ads on their cars and SUVs? A lot of what you heard might be a scam, but there are a few companies out there that will pay you up to $700 a month to advertise a product or company on the side of your car. 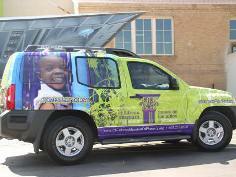 Free car media is regular passenger cars, not company cars, which are plastered with advertising. Owners of these cars receive a monthly check to compensate them for allowing advertisers to apply auto wraps to their automobiles. Some Scams Out There. Like working from home, filling out surveys, and licking envelopes, there are a lot of scammers out their looking to make a quick buck off of your hard need for a quick payday. While there are a few legitimate opportunities for a very small, limited number of people to make some cash via this advertising route, there are a lot of scammers prowling the internet attempting to prey on those hoping to join in on the potentially easy payday. So, you should always remember the golden rule of making money, “If a company demands that you to pay them for the right to access a money-making opportunity upfront, you should run away in the opposite direction as fast as possible.” You should never have to pay anyone to earn money. Paying a fee, buying a program or book, buying a system, or buying a list of anything in order to make money is a sure fire sign of a scam and an easy way to get ripped off. The Catch. While you can make money painting ads on your car, there are a few drawbacks to the scheme. There are only a few spots in high profile commuting corridors. You have to have a long or time consuming commute where a lot of people will see your car. Or, you also have to spend a lot of time running errands in your car. Drivers with the best chance live in areas with attractive demographics, i.e. income, age and willingness to spend. DrivenMedia, for example, loves soccer moms and those who drive near them. You also need to be prepared to talk about the product if someone corners you. Free Car Media and DrivenMedia are two firms that operate legit campaigns which look too match up car owners with long commutes and advertisers. Free Car Media has 800 to 1,000 cars on the road and pays its drivers $700 or more per month to allow their cars to be turned into billboards. DrivenMedia pays approximately $300 to $500 for the same thing. As you can imagine, the opportunities are very limited in number and geography. If you live in a sparsely populated part of the country, forget it. You also cannot drive a car that could have been turned in for the Cash For Clunkers program. Many firms also look for safe drivers who have not been caught speeding, etc. and have not accumulated points on their license. So, look at these programs as an idea if you have a nice car and a long commute. But, don’t bet the farm on them being available. Give it a try and you might look at it like playing the lottery. You might win, but definitely stay away from the scams out there. thanks for the interesting post, a good read, nice one.